Leaving Rajasthan, we took two night trains to cut across India to Varanasi, where we finally saw the Ganges River! 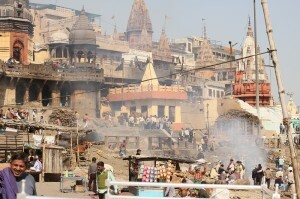 Holy to both Hindus and Buddhists, Varanasi is the oldest continuously inhabited city in India. Many faiths make pilgrimages to this city. 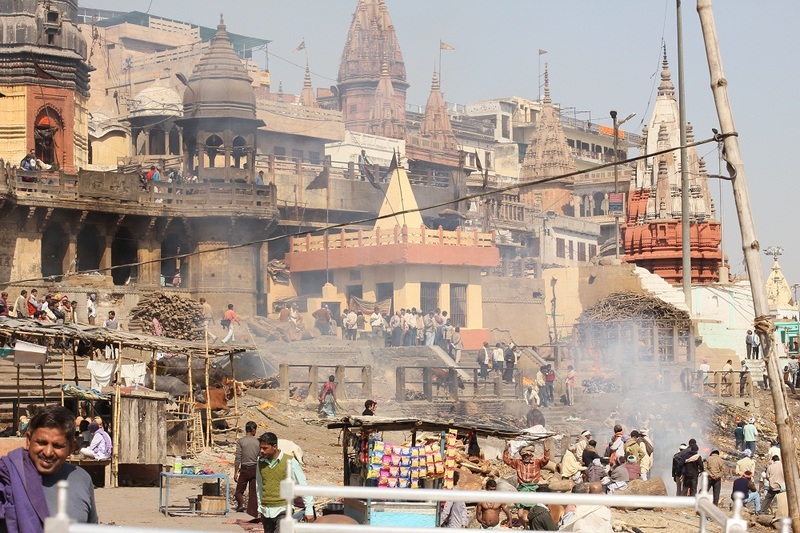 Hindus believe that washing in the Ganges pays for their sins and that Varanasi is a fortunate place to die because the water liberates a person’s soul from the cycle of reincarnation. The city is considered so auspicious that those on death’s doorstep actually come to Varanasi to spend their final days in hospices, some of which are just a stone’s throw away from the cremation grounds. There are almost 100 ghats (steps and platforms leading down to the river) that are used both for bathing and as cremation sites. We spent some time walking along the river and witnessed a few cremations (which are constantly occurring day and night). At first the dead were carried down the steps to the river. They were usually wrapped up in cloth and then placed on a carefully constructed wood pyre that was lit from an eternal flame that came from Lord Shiva, Varanasi’s patron god. Family member and friends, and whoever else was walking along the river at the time, watch as the dead burned away. Written by: kate on February 9, 2012.on February 17, 2012. Your link was indeed most interesting; spending 2 years in the area learning Hindi and forming friendships with the residence just to be able to document the cremation process and the life of those who live and work in the area. Fascinating really. The photography are equally as impressive.